Get immediate visibility and control to make better business decisions quickly. Drill into the detail of selected projects and setup any portfolio reports needed. Manage new project requests and approve with consistent, scalable Project Request Management. Create projects sites based on approved requests. Boost team performance with the right people working on the right projects. Understand work distribution, track the non-people resources and forecast resource needs. Ensure repeatable success by creating your project site with standardized project management templates. Assign and track tasks in one place and manage the timeline with ‘In-browser task scheduling’. Save time with flexible, easy-to-use reports and automated email sharing. Track and re-plan using configurable project status reports. Email reports and dashboards to stakeholders. Motivate and inform your project team so they can do their best work. Find, complete, and update ‘My Work‘ while also managing non-project work. Get a complete look at BrightWork project and portfolio management software for SharePoint. Leverage your existing SharePoint infrastructure security and expertise. Save your IT resources with a self-service, no-code project management solution. Help teams get projects under control quickly and confidently with best-practice, configurable project management templates. BrightWork grows and evolves with you and your processes. Easily create, use, reuse, and update your project management best-practices on an organizational scale. The range of different-sized project management templates supplied with BrightWork enable all projects to start with the right amount of project management for the project and team in question. With the BrightWork templates, processes do not have to be reinvented or relearned with every project as they are embedded right into the template and can be fine-tuned as needs demand. Deploy easily and quickly while leveraging your existing SharePoint expertise, infrastructure, and training. Schedule some time to talk to one of our Solution Experts and they will show you how BrightWork will help your team deliver more successful projects with SharePoint. Runs on SharePoint 2010, 2013, 2016, and 2019 (coming early this year). Scalable project request management for consistent and objective optimal project selection. Using a real-time cross project status dashboard delivers greater visibility for effective control. The Kanban Sharepoint web part is a modern, fast, and visual way to manage tasks in a drag-and-drop interface. Standardized project management templates ensure quick and consistent project setup for every project. High-visibility resource management ensures the best use of resources across all projects in the organization. Site collection navigation has been overhauled to improve speed, discoverability, and to simplify the options so you can spend more time working the project. 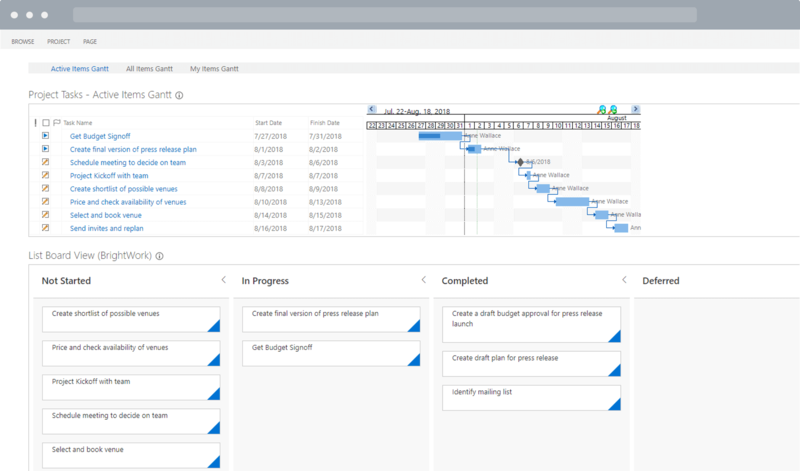 BrightWork templates guide the project plan setup, including an in-browser task scheduling capability right from the tasks list in SharePoint. Collaborative sites use project tracking software to house up-to-date project information, so you can easily monitor progress. Provide the high-level project portfolio dashboard that sponsors and other stakeholders need, with the ability to drill down to take a closer look at a project. With SharePoint task management, team members can easily manage their priorities across many projects and quickly provide updates right in the project site. Easy-to-configure templates and template management features make it simple to build improved processes into templates and roll them out to live projects. Project sites are created using an elegant and simple step-by-step interface, ensuring you have the right templates and processes for the project at hand. Get started in minutes with a simple and intuitive project management template for teams using SharePoint.